The Data Kraken wants to grow new tentacles. I am playing with the CMI – Control and Monitoring Interface – the logger / ‘ethernet gateway’ connected to our control units (UVR1611, UVR16x2) via CAN bus. The CMI has become a little Data Kraken itself: Inputs and outputs can be created for CAN bus and Modbus, and data from most CAN devices can also be logged via JSON. Are these features useful to integrate the datalogger of our photovoltaics inverter – Fronius Symo 4.5-3-M? I am now logging data to an USB stick and feed the CSV files to the SQL Server Data Kraken. The USB logger’s logging interval is 5 minutes whereas Modbus TCP allows for logging every few seconds. The inverter has built-in energy management features, but it can only ‘signal’ via a relay which also requires proper wiring. Modbus TCP, on the other hand, could use the existing WLAN connection of the inverter and the control unit could do something smarter with the sensor reading of the output power. My motivation is to test if you – as an UVR16x2 user – can re-use a logger you already have – the CMI – as much as possible, avoiding the need to run another ‘logging server’ all the time (Also my SQL Server is for analysis, not for real-time logging). I know that there are many open source Modbus clients available and that it is easy to write a Python script. Modbus settings, Fronius Datalogger, inverter’s local web server. 502 is the TCO standard port. The alternative to floating numbers is integers plus a varying scaling factor (SF), to be found in another register. PDF p.30, Common Inverter Model. For logging AC output power you need: Address 40092, type of register 3 (read and hold), datatype float32 (‘corresponds’ to two 16bit integer register, thus size 2). The address to be configured on a Modbus client is smaller than this address by 1 – so 40091 needs to be set to log AC power. Using these configuration parameters an analog Modbus Input is added at the CMI. The signal is ‘digital’ – but in field-bus-language everything that is not a single bit – 0/1 – seems to be ‘analog’. Modbus input at the CMI. Input value: 32bits read from the bus interpreted as an integer. Actual value: Integer part of the ‘true value’ = the 32bits interpreted as 32-bit float. Yes, I checked the network trace 😉 as the byte order dropdown menu confused me: According to the Modbus protocol specification Big Endian is required, not an option. Factors and data types: Only integer values are understood by CAN devices. Decimal places might be indicated by a scaling factor. The PV power value in Watt has enough significant digits; so the integer part of the float number is fine. But for current in Ampere – typically about 15A maximum – a Factor of 10 would be better. It would not have helped to select int + scaling factor at the inverter: The scaling factor would be stored in a second register, there is a different factor for every parameter, and you cannot configure another ‘scaling factor register’ per input at the CMI. Theoretically you could log the scaling factor separately and re-scale the value in a custom application – but then I would use a separate, custom logger. The CMI has the default node number 56 on the CAN bus. Other CAN devices on the bus can query it for this parameter by specifying node 56 and output no 1. CAN bus displayed on the CMI’s website. UVR1611 and UVR16x2 controllers can be managed by clicking their icons – which brings up a web page that resembles the controller’s local display. The CMI’s Logging page looks tempting – can we simply select the CMI itself as a CAN logging source – CAN 56? Configuration of the devices the CMI logs data from, via CAN bus. CAN 1 – UVR1611, CAN 2 – UVR16x3, CAN 41 – energy meter CAN-EZ. CAN error message displayed at the logger CMI when you try to configure the CMI also as a logging source. Configuration of a CAN input at the controller UVR16x2 (via CMI’s web interface to the controller). The value of AC power is displayed as integer without scaling. Had a factor of 10 been used at the Modbus input it would be ‘corrected’ here, using the Unit called dimensionless,1. Values received by the controller UVR16x2 over CAN bus. Result of all this: UVR16x2 knows PV power and can use it do magic smart things when controlling the heat pump. On the other hand, CMI can log this value – in the same way it logs all other sensor readings (after an update of the logging settings in the controller’s functional data, using TAPPS). Configuration of logging at cmi.ta.co.at: Supported loggers are UVR1611 and UVR16x2. Values to be logged are selected from all direct inputs / outputs / functions and from CAN network inputs and outputs. Data visualized at cmi.ta.co.at. Data logged via CAN are sent from the CMI to the web portal. Using this kind of logging for all values the inverter provides would be costly: It’s not just a column you add to a log file, but you occupy one of the limited inputs and outputs at the CMI and the controller. If you really need to know the voltage between phase 1 and 2 or apparent power you better stick with the USB file or use a separate Modbus logger like a Rasbperry Pi. This project is great and documented very well – data acqusition from a Symo inverter using Python plus a web front end. Sending Modbus data back and forth from the CMI to UVR controllers is only worth the efforts if you need them for control, not for ‘nice-to-have’ logging. Can the Efficiency Be Greater Than One? This is one of the perennial top search terms for this blog. Anticlimactic answer: Yes, because input and output are determined also by economics, not only by physics. Often readers search for the efficiency of a refrigerator. Its efficiency, the ratio of output and input energies, is greater than 1 because the ambient energy is free. System’s operators are interested in the money they pay the utility, in relation to the resulting energy for cooling. For photovoltaic panels the definition has sort of the opposite bias: The sun does not send a bill – as PV installers say in their company’s slogan – but the free solar ambient energy is considered, and thus their efficiency is ‘only’ ~20%. Half of our generator, now operational for three years: 10 panels, oriented south-east, 265W each, efficiency 16%. (The other 8 panels are oriented south-west). When systems are combined, you can invent all kinds of efficiencies, depending on system boundaries. If PV panels are ‘included’ in a heat pump system (calculation-wise) the nominal electrical input energy becomes lower. If solar thermal collectors are added to any heating system, the electrical or fossil fuel input decreases. Output energy may refer to energy measured directly at the outlet of the heat pump or boiler. But it might also mean the energy delivered to the heating circuits – after the thermal losses of a buffer tank have been accounted for. But not 100% of these losses are really lost, if the buffer tank is located in the house. I’ve seen many different definitions in regulations and related software tools, and you find articles about how to game interpret these guidelines to your advantage. Tools and standards also make arbitrary assumptions about storage tank losses, hysteresis parameter and the like – factors that might be critical for efficiency. Then there are scaling effects: When the design heat loads of two houses differ by a factor of 2, and the smaller house would use a scaled down heat pump (hypothetically providing 50% output power at the same efficiency), the smaller system’s efficiency is likely to be a bit lower. Auxiliary consumers of electricity – like heating circuit pumps or control systems – will not be perfectly scalable. But the smaller the required output energy is, the better it can be aligned with solar energy usage and storage by a ‘smart’ system – and this might outweigh the additional energy needed for ‘smartness’. Perhaps intermittent negative market prices of electricity could be leveraged. Definitions of efficiency are also culture-specific, tailored to an academic discipline or industry sector. There are different but remotely related concepts of rating how useful a source of energy is: Gibbs Free Energy is the maximum work a system can deliver, given that pressure and temperature do not change during the process considered – for example in a chemical reaction. On the other hand, Exergy is the useful ‘available’ energy ‘contained’ in a (part of a) system: Sources of energy and heat are rated; e.g. heat energy is only mechanically useful up to the maximum efficiency of an ideal Carnot process. Thus exergy depends on the temperature of the environment where waste heat ends up. The exergy efficiency of a Carnot process is 1, as waste heat is already factored in. On the other hand, the fuel used to drive the process may or may not be included and it may or may not be considered pure exergy – if it is, energy and exergy efficiency would be the same again. If heat energy flows from the hot to the cold part of a system in a heat exchanger, no energy is lost – but exergy is. You could also extend the system’s boundary spatially and on the time axis: Include investment costs or the cost of harm done to the environment. Consider the primary fuel / energy / exergy to ‘generate’ electricity: If a thermal power plant has 40% efficiency then the heat pump’s efficiency needs to be at least 2,5 to ‘compensate’ for that. In summary, ‘efficiency’ is the ratio of an output and an input energy, and the definitions may be rather arbitrary as and these energies are determined by a ‘sampling’ time, system boundaries, and additional ‘ratings’. Our photovoltaic generator has about 5 kW rated ‘peak’ power – 18 panels with 265W each. South-east oriented part of our generator – 10 panels. The remaining 8 are oriented south-west. an incident angle of sunlight relative to zenith of about 48°C – equivalent to an air mass of 1,5. This determines the spectrum of the electromagnetic radiation. an irradiance of solar energy of 1kW per square meter. Simulated spectra for different air masses (Wikimedia, User Solar Gate). For AM 1 the path of sunlight is shortest and thus absorption is lowest. Canceling kW, you end up with 1 kWp being equivalent to an area of 1 m2. Why is this a useful unit? The less efficient solar panels are, the more of them you need to obtain a certain target output power. A perfect generator would deliver 1 kW output with a size of 1 m2 at standard test conditions. The kWp rating is equivalent to the area of an ideal generator that would generate the same output power, and it helps with evaluating if your rooftop area is large enough. Our 4,77 kW generator uses 18 panels, about 1,61 m2 each – so 29 m2 in total. Panels’ efficiency is then about 4,77 / 29 = 16,4% – a number you can also find in the datasheet. There is no rated power comparable to that for solar thermal collectors, so I wonder why the unit has been defined in this way. Speculating wildly: Physicists working on solar cells usually have a background in solid state physics, and the design of the kWp rating is equivalent to a familiar concept: Scattering cross section. … the same sort of ratio as discussed above! Power cancels out and the result is an area, imagined as a ‘cross-section’. The atom acts as if it were an opaque disk of a certain area that ‘cuts out’ a respective part of the incident beam and re-radiates it. … we needed 6.600 kWh of electrical energy in total. … in order to ‘pump it up to’ 16.800 kWh of heating energy (incl. hot tap water heating). This was a mild season! . The remaining 3.000kWh were used by household and office appliances, control, and circulation pumps. … harvested about 5.600kWh / year – not too bad for our 4,8kW system with panels oriented partly south-east and partly south-west. 2.000 kWh of that were used directly and the rest was fed into the grid. 35% of PV energy produced was utilized immediately (self-consumption quota). Monthly energy balances show the striking difference between summer and winter: In summer the small energy needed to heat hot water can easily be provided by solar power. But in winter only a fraction of the energy needed can be harvested, even on perfectly sunny days. … and as the sum of energy consumed immediately and the rest provided by the utility. The total energy ‘generated’ by the solar panels, as a sum of the energy consumed directly (same aqua bar as in the sum of consumption) and the rest fed into the grid. In June we needed only 300kWh (10kWh per day). The PV total output was more then 700kWh, and 200kW of that was directly delivered by the PV system – so the PV generator covered 65%. It would be rather easy to become autonomous by using a small, <10kWh battery and ‘shifting’ the missing 3,3kWh per day from sunny to dark hours. But in January we needed 1100kWh and PV provided less than 200kWh in total. So a battery would not help as there is no energy left to be ‘shifted’. Our house’s heat consumption is typical for a well-renovated old building. If we would re-build our house from scratch, according to low energy standards, we might need only 50-60% energy at best. Then heat pump’s input energy could be cut in half (violet bar). But even then, daily total energy consumption would exceed PV production. I have covered economics of the system without battery here and our system has lived up to the expectations: Profits were € 575, the sum of energy sales at market price (€ 0,06 / kWh) and by not having to pay € 0,18 for power consumed directly. But it is also interesting to compare profits to heating costs: In this season electrical energy needed for the heat pump translates to € 650. So our profits from the PV generator nearly amounts to the total heating costs. Last year’s assessment of the economics of a system with battery is still valid: We could increase self-sufficiency from 30% to 55% using a battery and ‘shift’ additional 2.000 kWh to the dark hours. This would result in additional € 240 profits of per year. If a battery has a life time of 20 years (optimistic estimate!) it must not cost more than € 5.000 to ever pay itself off. This is less than prices I have seen in quotes so far. Planning a true off-grid system is planning for a few days in a row without sunshine. Increasing the size of the battery would not help: The larger the battery the larger the losses, and in winter the battery would never be full. It is hard to store thermal energy for another season, but it is even harder to store electrical energy. 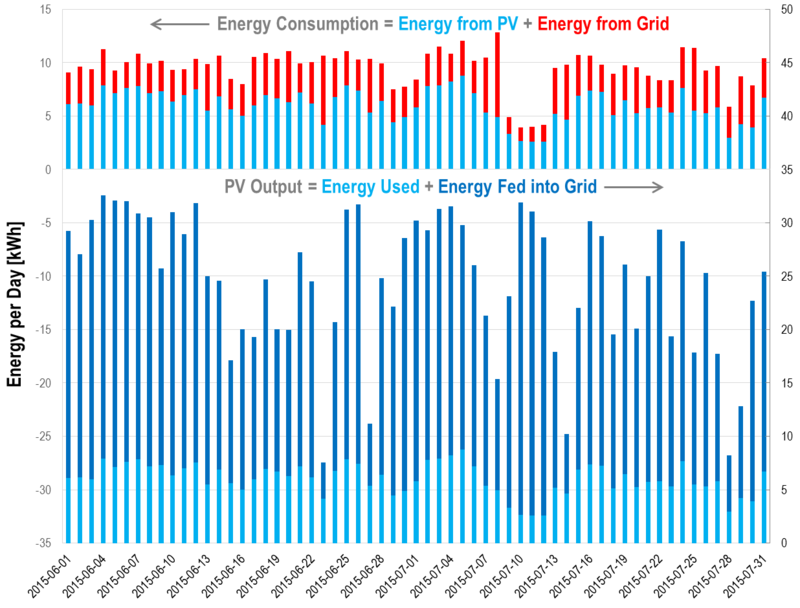 Theoretically, the area of panels could be massively oversized (by a factor – not a small investment), but then even more surplus has to be ‘wasted’ in summer. 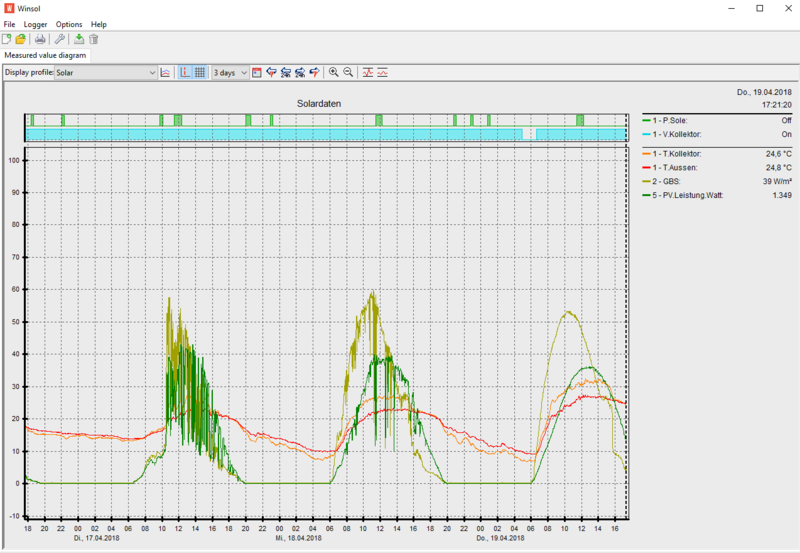 The system has to provide enough energy per day and required peak load in every moment (see spikes in the previous post), but power needs also to be distributed to the 3 phases of electrical power in the right proportion: In Austria energy meters calculate a sum over 3 phases: A system might seem ‘autonomous’ when connected to the grid, but it would not be able to operate off-grid. Example: The PV generator produces 1kW per phase = 3kW in total, while 2kW are used by a water cooker on phase 1. The meter says you feed in 1kW to the grid, but technically you need 1kW extra from the grid for the water cooker and feed in 1kW on phase 2 and 3 each; so there is a surplus of 1kW in total. Disconnected from the grid, the water cooker would not work as 1kW is missing. A battery does not provide off-grid capabilities automatically, nor do PV panels provide backup power when the sun is shining but the grid is down: During a power outage the PV system’s inverter has to turn off the whole system – otherwise people working on the power lines outside could be hurt by the power fed into the grid. True backup systems need to disconnect from the power grid safely first. Backup capabilities need to be compliant with local safety regulations and come with additional (potentially clunky / expensive) gadgets. So I wrote about our lightning protection, installed together with our photovoltaic generator. Now our PV generator is operational for 11 months and we have encountered one alien attack, albeit by beneficial aliens. This is the electrical output power of our generator – oriented partly south-east, partly south-west – for some selected nearly perfectly cloudless days last year. Even in darkest winter you could fit the 2kW peak that a water cooker or heat pump needs under the curve at noon. We can heat hot water once a day on a really sunny day but not provide enough energy for room heating (monthly statistics here). There are two possible explanations: 1) Increase in solar cell efficiency as the panels cool off while shadowed or 2) ‘focusing’ (refraction) of radiation by the edges of nearby clouds. Such 4kW peaks lasting only a few seconds wide are not uncommon, but typically they do not show up in our standard logging, comprising 5-minute averages. At that day, the sun was lingering right at the edge of clouds for some time, and global radiation was likely to be higher than expected due to the focusing effect. The jump in global radiation at 11:30 is clearly visible in our measurements of radiation. But in addition panels had been heated up before by the peak in solar radiation and air temperature had risen, too. So the different effects cannot be disentangled easily . Power drops by 0,44% of the rated power per decrease in °C of panel temperature. Our generator has 4,77kW, so power decreases by 21W/°C panel temperature. At 11:30 power was by 1,3kW higher than power on the normal reference day – the theoretical equivalent of a panel temperature decrease by 62°C. I think I can safely attribute the initial surge in output power to the unusual peak in global radiation only. At 12:30 output power is lower by 300W on the normal sunny day compared to the alien day. This can partly be attributed to the lower input radiation, and partly to a higher ambient temperature. But only if input radiation is changing slowly, panel temperature has a simple, linear relationship with input temperature. The sun might be blocked for a very short period – shorter than our standard logging interval of 90s for radiation – and the surface of panels cools off intermittently. It is an interesting optimization problem: By just the right combination of blocking period and sunny period overall output could be maximized. The difference in peak power was about 750W. The panel temperature difference to account for that would have to be about 36°. This is three times the measured difference in ambient temperature of 39°C – 27°C = 12°C. Is this plausible? PV planners use a worst-case panel temperature of 75°C – for worst-case hot days like August 12, 2015. Normal Operating Cell Temperature of panels is about 46°C. Normal conditions are: 20°C of ambient air, 800W/m2 solar radiation, and free-standing panels. One panel has an area of about 1,61m2; our generator with 18 panels has 29m2, so 800W/m2 translates to 23kW. Since the efficiency of solar panels is about 16%, 23kW of input generates about 3,7kW output power – about the average of the peak values of the two days in August. Our panels are attached to the roof and not free-standing – which is expected to result in a temperature increase of 10°C. So we had been close to normal conditions at noon radiation-wise, and if we had been able to crank ambient temperature down to 20°C in August, panel temperature had been about 46°C + 10°C = 56°C. 20°C 56°C Normal operating conditions, plus typical temperature increase for well-vented rooftop panels. 27°C 63°C August 1. Measured ambient temperature, solar cell temperature interpolated. 39°C 75°C August 12. Measured ambient temperature. Panel temperature is an estimate for the worst case. Under perfectly stable conditions panel temperature would have differed by 12°C, resulting in a difference of only ~ 250W (12°C * 21W/°C). Even considering higher panel temperatures at the hotter day or a non-linear relationship between air temperature and panel temperature will not easily give you the 35° of temperature difference required to explain the observed difference of 750W. At about 10:45 global radiation for the cooler day, August 1, starts to fluctuate – most likely even more wildly than we see with the 90s interval. Before 10:45, the difference in output power for the two days is actually more like 200-300W – so in line with my haphazard estimate for steady-state conditions. Then at noon the ‘focusing’ effect could have kicked in, and panel surface temperature might haved fluctuated between 27°C air temperature minimum and the estimated 63°C. Both of these effects could result in the required additional increase of a few 100W. Since ‘focusing’ is actually refraction by particles in the thinned out edges of clouds, I wonder if the effect could also be caused by barely visible variations of the density of mist in the sky as I remember the hot period in August 2015 as sweltry and a bit hazy, rather than partly cloudy. I think it is likely that both beneficial effects – temperature and ‘focusing’ – will always be observed in unison. On February 11 I had the chance to see the effect of focusing only (or traces of an alien spaceship that just exited a worm-hole) for about half an hour. Current-voltage curve of a solar cell – containing a temperature-dependent exponential function. The effect of temperature in depth. Can You Get More than 100% Solar Energy? Note especially this comment – describing refraction, and pointing out that refraction of light can ‘focus’ light that would otherwise have been scattered back into space. This commentator also proposes different mechanism for short spikes in power and increase of power during extended periods (such as I observed on February 11). I have noticed the impact of traversing clouds on solar power output: Immediately after a cloud has passed, power surges to a record value. This can be attributed to the focusing effect of the surrounding clouds and/or cooling of the panels. Comparing data for cloudless days in May and June, I noticed a degradation of power – most likely due to higher ambient temperatures in June. Global radiation on a vertical plane, at the position of the solar thermal collector used with the heat pump system. Two (nearly) cloudless days, in order to rule out the impact of shadowing at different times of the days. These days should not be separated by too many other days, to rule out the effect of the changing daily path of the sun. Ideally, air temperature should be very different on these days but global radiation should be the the same. Daily output of the photovoltaics generator (4,77 kW peak), compared to average and maximum air temperatures and to the global radiation on a vertical plane. Dotted vertical lines indicate three days nearly without clouds. August 12 was a record-breaking day with a maximum temperature of 39,5°C. August 1 was one of the ‘cool’ but still perfectly sunny days in August. The ‘cold day’ resulted in a much higher PV output, despite similar input in terms of radiation. For cross-checking I have also included August 30: Still fairly hot, but showing a rather high PV output, at a slightly higher input energy. Same data as previous plot, zoomed in on August. Dotted lines indicate the days compared in more detail. Detailed logging of ambient air temperature and output power of the photovoltaic generator on three nearly cloudless days in August 2015. The higher the ambient air temperature, the lower the output power. Note that the effect of temperature can more than compensate for the actually higher radiation for the middle curve (August 30). I have used global radiation on a vertical plane as an indicator of radiation, not claiming that it is related to the radiation that would be measured on the roof – or on a horizontal plane, as it is usually done – in a simple way. We measure radiation at the position of our ribbed pipe collector that serves as a heat source for the heat pump; it is oriented vertically so that it resembles the orientation of that collector and allows us for using these data as input for our simulations of the performance of the heat pump system. Global radiation in W per square meter on a vertical plane, measured at the position of the solar collector. The collector is installed on the ground, fence-like, behind the house, about north-east of it. Yet, if you compare two cloudless days where the sun traversed about the same path (thus days close in the calendar) you can conclude that solar radiation everywhere – including the position on the roof – was the same if these oddly shaped curves are alike. This plot shows that the curves for these two days that differed a lot in output and temperature, August 1 and 12, were really similar. Actually, the cooler day with higher PV output, August 1, even showed the lower solar radiation due to some spikes. 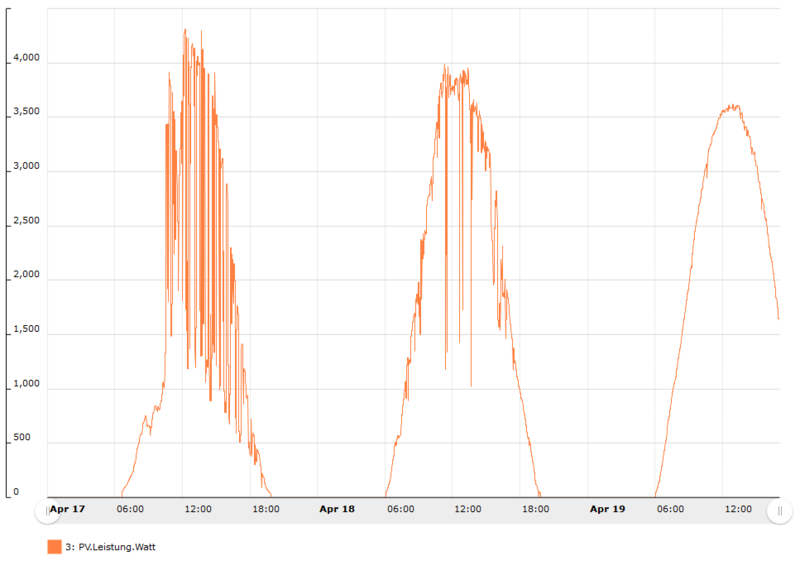 Since the PV inverter only logs every 5 minutes whereas our system’s monitoring logs every 1,5 minutes those spikes might have been averaged out in the PV power curves. August 30 clearly showed higher radiation which can account for the higher output energy. But – as shown above – the higher solar power could not compensate for the higher ambient temperature. Temperature and solar radiation have been measured using sensors attached to universal control UVR1611 by Technische Alternative and C.M.I. as data logger, logging interval 90 seconds. Temperature sensor – PT1000, radiation sensor. Log files are exported daily to CSV files using Winsol. PV output power has been measured by Datamanager 2.0 included with PV inverter Fronius Symo 4.5-3-M, logging interval 5 minutes, logged to USB stick. CSV log files are imported into Microsoft SQL Server 2014 for analysis and consolidation. Plots are created with Microsoft Excel as front end to SQL Server. July 2015 was the hottest July ever since meteorological data had been recorded in Austria (since 248 years). We had more than 38°C ambient air temperature at some days; so finally a chance to stress-test our heat pump system’s cooling option. In space heating ‘winter’ mode, the heat pump extracts heat from the heat source – a combination of underground water / ice tank and unglazed solar collector – and heats the bulk volume of the buffer storage tank. We have two heating circuits exchanging heat with this tank – one for the classical old radiators in ground floor, and one for the floor heating loops in the first floor – our repurposed attic. Space heating mode: The heat pump (1) heats the buffer tank (7), which in turn heats the heating circuits (only one circuit shown, each has its circuit pump and mixer control). Heat source: Solar/air collector (4) and water / ice storage (3) connected in a single brine circuit. The heat exchanger in the tank is built from the same ribbed pipes as the solar collector. If the ambient temperature is too low too allow for harvesting of energy the 3-way valve (5) makes the brine flow bypass the collector. The heat pump either heats the buffer tank for space heating, or the hygienic tank for hot tap water. (This posting has a plot with heating power versus time for both modes). We heat hot tap water indirectly, using a hygienic storage tank with a large internal heat exchanger. Therefore we don’t need to fight legionella by heating to high temperatures, and we only need to heat the bulk volume of the tank to 50°C – which keeps the Coefficient of Performance high. Hot tap water heating mode: The flow of water heated by the heat pump is diverted to the hygienic storage tank (6). Otherwise, the heat source is used in the same way as for space heating. In this picture, the collector is ‘turned off’ – corresponding to heating water on e.g. a very cold winter evening. In summer, the still rather cold underground water tank can be used for cooling. Our floor heating loops become cooling loops and we simply use the cool water or ice in the underground tank for natural (‘passive’) cooling. So the heat pump can keep heating water – this is different from systems that turn an air-air heat pump into an air conditioner by reverting the cycle of the refrigerant. Heating hot water in parallel to cooling is beneficial as the heat pump extracts heat from the underground tank and cools it further! Cooling mode: Via automated 3-way valve (9) brine is diverted to flow through the heat exchanger in the buffer tank (7). Water in the buffer tank is cooled down so water in the floor ‘heating’ / cooling loops. If the heat pump operates in parallel to heat hot tap water, it cools the brine. The red arrow indicates the end of the ice period; then the set temperature of the tank was 8°C (‘Ice storage tank’ is rather a common term denoting this type of heat source than indicating that it really contains ice all the time.) Green arrows indicate three spells of hot weather. The tank’s temperature increased gradually, being heating by the surrounding ground and by space cooling. At the beginning of August its temperature is close to 20°C, so cooling energy has nearly be used up completely. At the beginning of July the minimum inlet temperature in the floor loops was 17°C, determined by the dew point (monitored by our control system that controls the mixer accordingly); at the end of the month maximum daily ambient air temperatures were greater than 35°C, and the cooling water had about 21°C. Room temperature. Cooling was activated only if the room temperature in the 1st floor was higher than 24°C – this allows for keeping as much cooling energy as possible for the really hot periods. We feel that 25°C in the office is absolutely OK as temperatures outside are more then 10°C higher. Scheduling hot water heating. After the installation of our PV panels we set the hot water heating time slots to periods with high solar radiation – when you have more than 2 kW output power on cloudless days. So we utilized the solar energy generator in the most economic way and the heat pump supports cooling exactly when cooling is needed. Using the collector for cooling in the night. If the ambient temperature drops to a value lower than the tank temperature, the solar collector can actually cool the tank! Manually operated ventilation – to be shut off at sunrise. We had already 30°C air temperature at 08:00 AM on some days. South-east deflector shields down. We feel there is still enough light in the (single large) room as we only activate the subset of shields facing the sun directly. The blue line exhibits the cooling power measured for the brine ‘cooling’ circuit. If the heat pump is off, cooling power is about 1 kW; during heat pump operations (blue arrows) 4 kW cooling power can be obtained. Night-time ventilation is crucial to keep room temperatures at reasonable levels. The cooling power is lower than so-called standard cooling load as defined in AC standards – the power required to keep the temperature at about 24°C in steady-state conditions, when ambient temperature would be 30°C and no shades are used. For our attic-office this standard cooling power would amount to more than 10 kW which is higher than the standard (worst case) heating load in winter. I have been asked for a comparison of the energy needed in the house, the heat pump in particular, and the energy delivered by the PV panels and fed in to the grid. Currently the weather forecast says, we will have more than 35°C each noon and 20-25° minimum in the night until end of this week. We might experience the utter depletion of our cooling energy storage before it will be replenished again on a rainy next weekend.